Many different animals live on the savannah in Africa. We all know some of them, while others remain relatively unknown. Then there are some very special animals that only a few people ever get to meet. Fewer people have, for example, heard of Africa’s unicorn – the okapi, which resembles a mish-mash of different animals – than the antelope. Below, you can read about five lesser-known savannah animals you can be lucky enough to see in Africa. 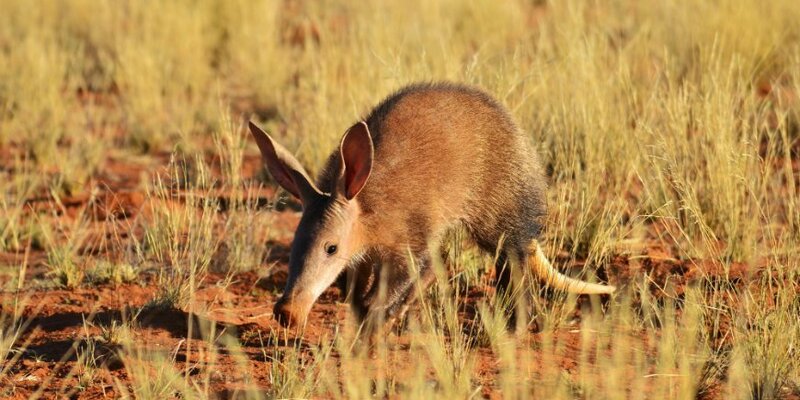 The aardvark – which is Afrikaans for “earth pig” – is a small nocturnal animal living south of the Sahara. Its name comes from its slightly strange appearance. “Earth pig” refers to its pig-like face with a snout, which it uses to burrow in anthills or termite mounds. It has folds of skin in its nose which prevent it from inhaling soil, ants and termites when sniffing out food. A full-grown aardvark can weigh up to 100 kg and eat up to 50,000 termites in one night. The aardvark is quite harmless to humans, and the locals have a bit of a love-hate relationship with it. It keeps the termites down, helping to protect the locals’ homes. However, it digs a lot of holes in the fields, destroying crops. 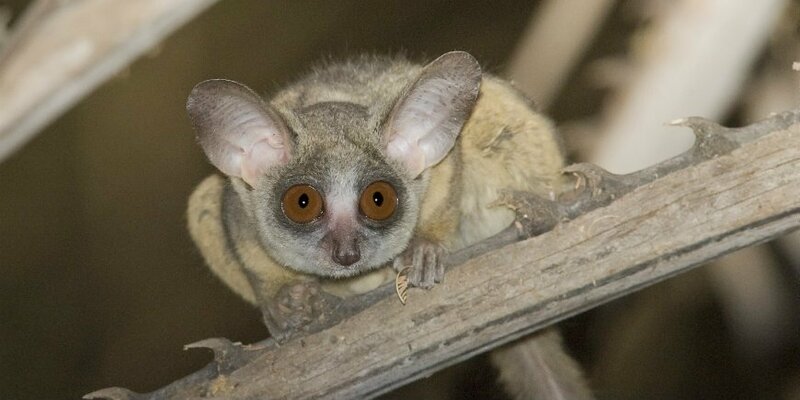 Measuring an average of 13 cm, the galago – or bush baby as it is otherwise known – is the smallest primate in Africa. They are hard to spot, but can often be heard at night as they have a very distinctive call, reminiscent of a child’s cry – hence the name bush baby. Galagos can move at great speed. When they catch food, they stand on their hind legs, leaving their forelimbs free to grab moths and grasshoppers in the air. The little animals are also known to be agile jumpers, able to leap up to 2 metres in the air. A unique thing about the species is that it has almost an extra tongue under its normal tongue, which is used together with its teeth when grooming its fur. The sole purpose of tongue number two is to care for its coat. 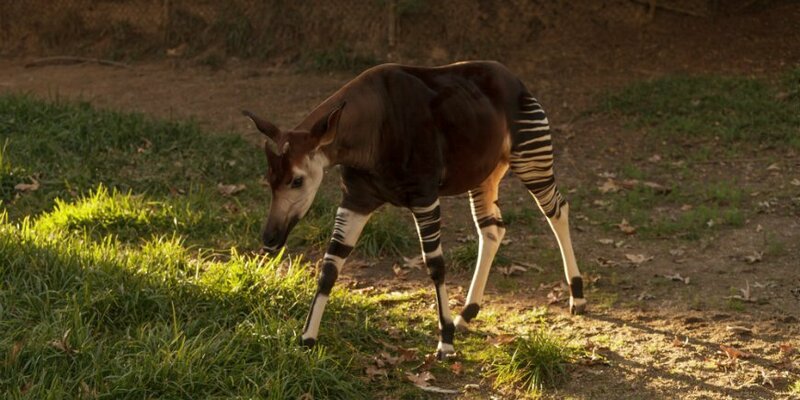 The okapi is a mammal we don’t know a lot about as yet. With striped legs like a zebra, a head like a giraffe and a body that resembles a horse, it certainly looks mysterious. Although you might think it was related to the zebra, it’s actually a member of the giraffe family. Prior to 1900, when it was discovered by researchers, it was known as the African unicorn, as it was thought that the species was a myth and didn’t exist. It has a call of 14 Hz, which is so low that it is inaudible to the human ear. Humans can only hear sounds of 20 Hz and above. The pangolin is an out-of-the-ordinary mammal. The keratin scales that cover the animal’s entire body apart from its head account for 20% of its total weight. Its tongue can grow up to 40 cm. long. It rolls into a ball if it is under attack and it has no teeth. The mammal lives off ants and termites and digests the food by eating gravel and sand. Its sharp claws help it find the food when it digs holes in the ground under the bushes. 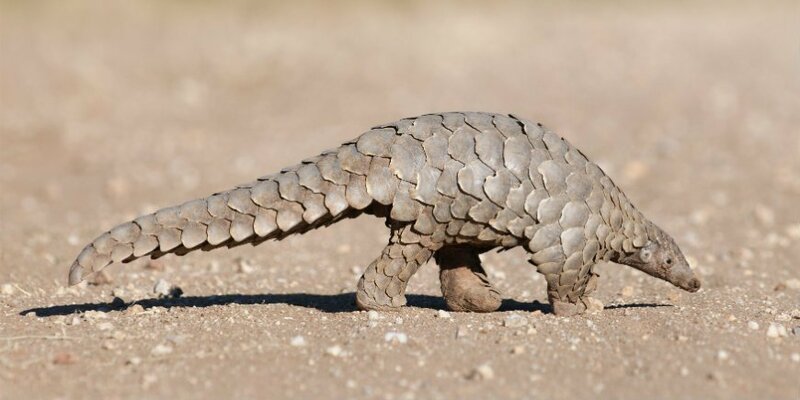 The pangolin lives in tropical areas in Africa, on the savannah or in the forest, from Sudan to Namibia and Botswana. And the forest – and the trees in particular – is important to the mammal if there is danger afoot. Unfortunately, the animal, which looks like it is wearing armour, is the world’s most trafficked mammal. 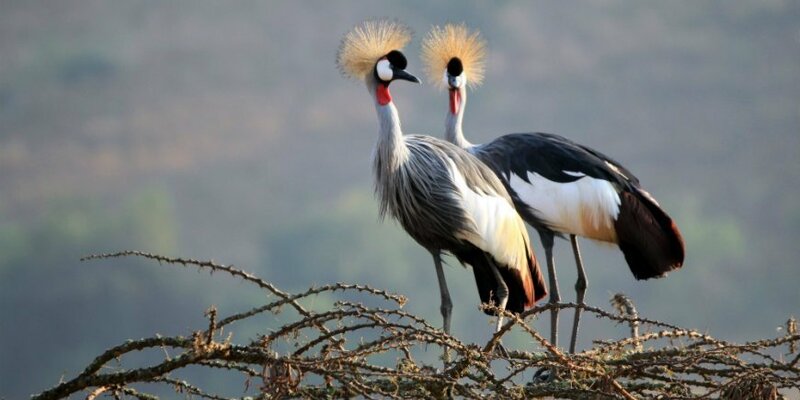 The grey crowned crane is a sight to behold. Its beautiful golden crown, its grey body plumage and not least its bright red temples and throat pouch are just some of the unique characteristics of the bird. It lives in southern and eastern parts of Africa – from Uganda/Kenya to south-eastern South Africa – around rivers, swamps and the savannah. The crane is about 1 metre tall with a wingspan of about 2 metres and weighs 3–4 kg. It lives off plants, seeds, insects and frogs. 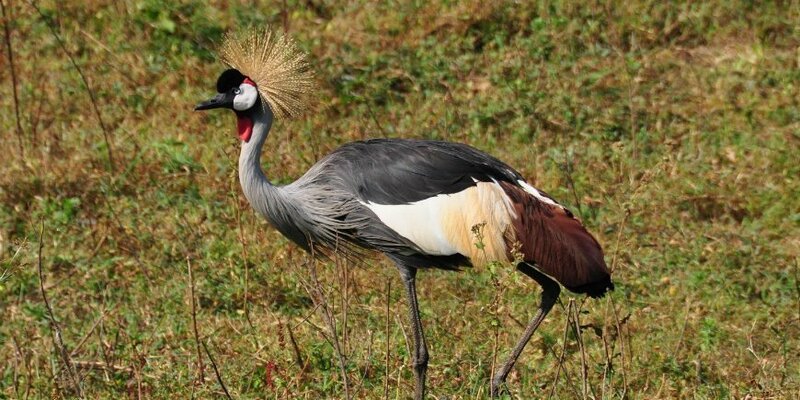 When attempting to attract a mate, the grey crowned crane has a breeding display involving sounds, dancing and jumping. This beautiful bird is the African crane you are most likely to see, as there are more of them than other species. But it is nevertheless an endangered species. The savannah is home to thousands of different wild animals, large and small. You can therefore expect to enjoy some wonderful experiences on your safari in addition to the classic safari animals. Want to experience the exciting wildlife on the savannah in one of Africa’s many countries? Take a look at one of our destinations, such as Tanzania, South Africa, Kenya or Namibia, or contact our travel consultants who are on hand to help you find the perfect safari for you.